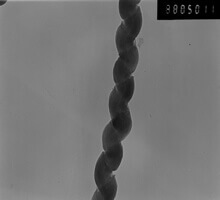 Helical Multi Walled Carbon Nanotubes are grown to be wrapped around each other in a helix pattern. The content of helical structure CNTs is about 80wt%. The rest is standard CNTs. The total CNTs content is more than 90wt%, and most of the CNTs have 100-200nm outer diameter. To find the price for a specific product and quantity, please click thru to the individual product page and enter the quantity you need. Our website will display the price for that specific quantity. Quotes are available online thru our cart. Simply add the products and quantities you need into the cart and then you can print or download a quote. Whenever you have distinctive geometries at the nanoscale you get distinctive properties. The structures of helical multi walled carbon nanotubes have been studied by selected area electron diffraction (SAED) methods in parallel with high resolution transmission electron microscopy. The diffraction patterns confirm the existence of a variety of structures in the nanotubes. The tube may have a cross section that is either circular or polygonal with extended flat regions. Tubes of circular cross section may contain from 1 to 9 or more different helix angles depending upon the number of graphitic sheets in the tube, as indicated by the number of hexagonal sets of hk0 spots, mutually rotated, appearing in the SAED patterns. The helix angle changes after every three to five graphitic sheets. For most tubes the helix angles increase by regular increments, likey due to the residual memory effect of the successive sheet groups on the underlying helical structure. Analysis of the way in which the hexagonal configuration of carbon atoms in successive sheets may fit together suggests that neighboring sheets may maintain the same helix angle by changing the pitch of the helix, and that the helix angles within symmetrical tubes are limited to a well defined set of possible values in agreement with experimental observations. For tubes of polygonal cross section, hkℓ spots are seen to lie on characteristic ellipses in the SAED patterns, and a grouping of fringes in the HRTEM images is seen to correspond with the groups of graphitic sheets having a constant helix angle.